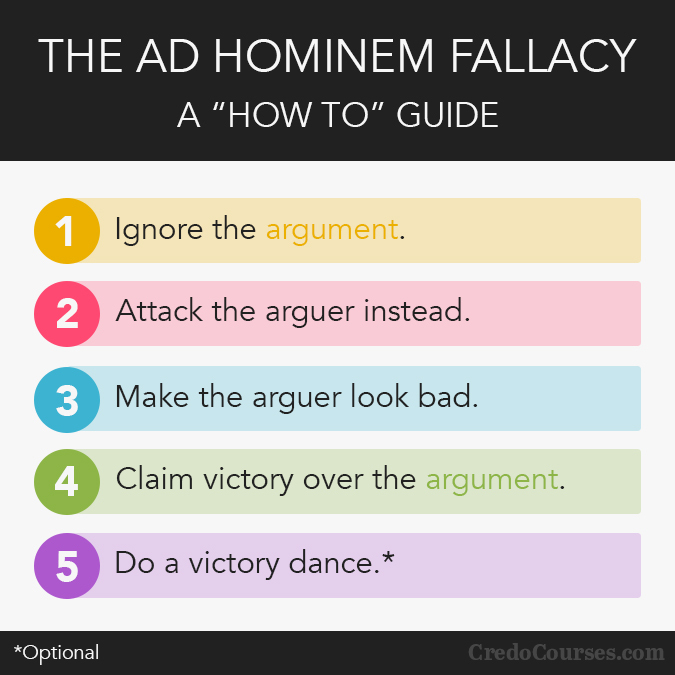 The ad hominem fallacy is common and commonly misunderstood. Make the arguer look bad. Claim victory over the argument. That last step is optional. The essential element is that you attack the argument rather than the arguer but then claim victory of the argument anyway. You hope the audience will mentally transfer their dislike of the arguer to the argument. If you attack your opponent before they present an argument in hopes of discrediting them right away, you’ve committed the fallacy of “poisoning the well” (a topic for a future blog post perhaps). The ad hominem fallacy misses the point. The arguer may be an angle or a demon (metaphorically). Yet the truth value of their premises and connection of premises to conclusion are still the point. The abusive form of the ad hominem fallacy is probably the most common. Arguer: Dr. Milton Friedman was in favor of legalizing powerful drugs. But Dr. Friedman was a noted libertarian bordering on anarchist and had a deep dislike for government. Therefore, his opinions about legalizing drugs should be ignored. Do you see what happened? The arguer failed to address any arguments. Instead, they said something they perceived as negative about Dr. Friedman; he was a libertarian and had a deep dislike for government. Why doesn’t this work? Let’s consider a humorous example. What if Dr. Friedman argued that the earth revolves around the sun (which indeed it does)? Should we ignore that as well because of the nasty things said of him? The truth value of whether or not the earth revolves around the sun is independent of Dr. Friedman’s political views. The circumstantial form of the ad hominem fallacy is also very common. The difference between this form and the abusive form is that the this form seeks to cast doubt on the argument because of some circumstance related to the arguer. Arguer: Sam the grocer says that we shouldn’t allow the big box retail store to move into town because they don’t pay their workers well. But Sam owns a small business that would be directly impacted by the big box store. Sam’s argument is obviously bogus. This one sounds a little better than the abusive version because it isn’t so blatantly misdirected. In addition, if the circumstances the arguer points out are true, the ad hominem circumstantial may be persuasive. However, even if the arguer is right about Sam’s circumstances, Sam may be right; the big box retail store may not pay their employees well (whatever “well” means). Because the ad hominem circumstantial doesn’t deal with the truth of the actual argument, it’s fallacious. The tu quoque version of the ad hominem fallacy occurs when someone accuses the arguer of doing the very thing they’re arguing against. Here’s an example centered around the issue of healthy eating. Arguer: Tim says that because the Bible says our bodies are the temple of God, we should eat the right kinds of foods and get plenty of exercise. But Tim eats junk food all the time! Clearly, Tim doesn’t know what he’s talking about, and it doesn’t make much difference whether I eat healthy or not. The tu quoque version of the ad hominem can often be observed between parents and children. The child rejects the advice from the parent about not smoking because, after all, the parent smokes like a train. Monkey see, monkey do. Is the parent wrong because they don’t “practice what they preach”? Is smoking good for your health? The impact on one’s health from smoking is independent of whether or not the person giving the advice smokes. Similarly, an overweight person may give great dieting advice, but not apply that advice themselves. Calling someone a name or insulting them is not sufficient to say that someone has committed the ad hominem fallacy. It must be coupled with the assertion or at least implication that because of these negative things you’ve said, the argument itself is disproven. 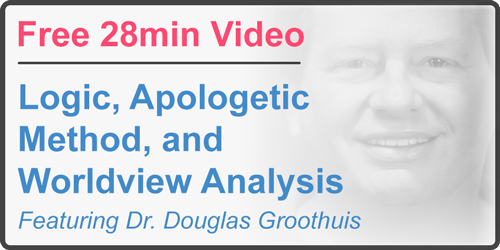 Dr. William Lane Craig dealt with this confusion when he was accused by a questioner of having committed the ad hominem fallacy. Questioner: […] that we wouldn’t hear ad hominems or attacks from your position or your side. I did want to bring this to your attention and get your response. After the panel that you appeared on with the late Christopher Hitchens, you referred to him in an interview with Christian radio as quote (and this is on YouTube), “Wesley, oily, and lacking in intellectual substance.” You then referred to, in your debate with Richard Carrier while he was there, to him as a “hack.” You also referred to fans of Richard Dawkins in an interview (and this is also on YouTube), “Dawkins is so popular because he, because people are so unsophisticated, inept, sophomoric, they cannot think logically, uninformed, silly, ignorant, and the result (and this is your words) of an educational system that has been dumbed down.” Mr. Craig, quite frankly, is this hypocrisy or is this just a glimpse of the real William Lane Craig? William Lane Craig: Well I think it’s a glimpse of the real William Lane Craig. Questioner: Apparently they appreciate ad hominem too. William Lane Craig: No. No. Well, I don’t know that. Maybe it’s important to describe what an ad hominem is. That means literally “against the man.” And what an ad hominem argument would be is that the reason you reject his conclusion is because you attack his person. Maybe like attacking me for these aspersion–now wait now, let, let me finish–it would be like saying that my conclusions are wrong because I’ve said all of these nasty things. See that would be an ad hominem argument. But in none of these cases that you’ve quoted where you’ve compiled words—not strung together at once but you’ve put them together—in none of these cases, I think, will you find that I ever reject a person’s argument or conclusions on that basis. Rather these were probably said in response to questions like tonight where I said some pretty negative things about folks rejecting God for emotional reasons rather than intellectual reasons. And I would certainly reiterate what I said about the lack of sophistication and the dumbed down educational system. But in no case is this committing an ad hominem fallacy where I say that their conclusions are wrong because of those things. I’m just… I’ve been asked to characterize certain things as I was tonight, and I’ve given my honest characterization that I would stand by. I mean I think it is, it is true all of those things that I said. But it’s not an ad hominem fallacy. At most it would be impolite maybe. You could indict me for being impolite. Questioner: Thank you very much. I appreciate that. Someone may say, “You’re ugly.” That’s not an ad hominem. If they say, “You’re ugly, therefore your argument is false,” they’ve then committed the ad hominem fallacy (specifically of the abusive variety). I Corinthians 1:20 Where is the one who is wise? Where is the scribe? Where is the debater of this age? Has not God made foolish the wisdom of the world? Galatians 5:12 I wish those who unsettle you would emasculate themselves! These biblical references can serve as examples of how Christians may interact. Surely, our speech must always be kind, gentle, and aimed at producing love. However, it’s fallacious (specifically the fallacy of equivocation) to make “kind, gentle, and loving” identical to “not cutting.” We must also recognize that before we can love our fellow man, we must first and foremost love God. Certainly, those religious leaders Jesus and his disciples opposed would not have considered them to be loving or gentle. Condemnation of sin is often confused with condemnation of the sinner. Christians must never knowingly engage in ad hominem arguments. It insults the image of God in your opponent, disrespects your own God given dignity, and is a poor representation to anyone listening of the intellectual rigor Christianity has to offer. 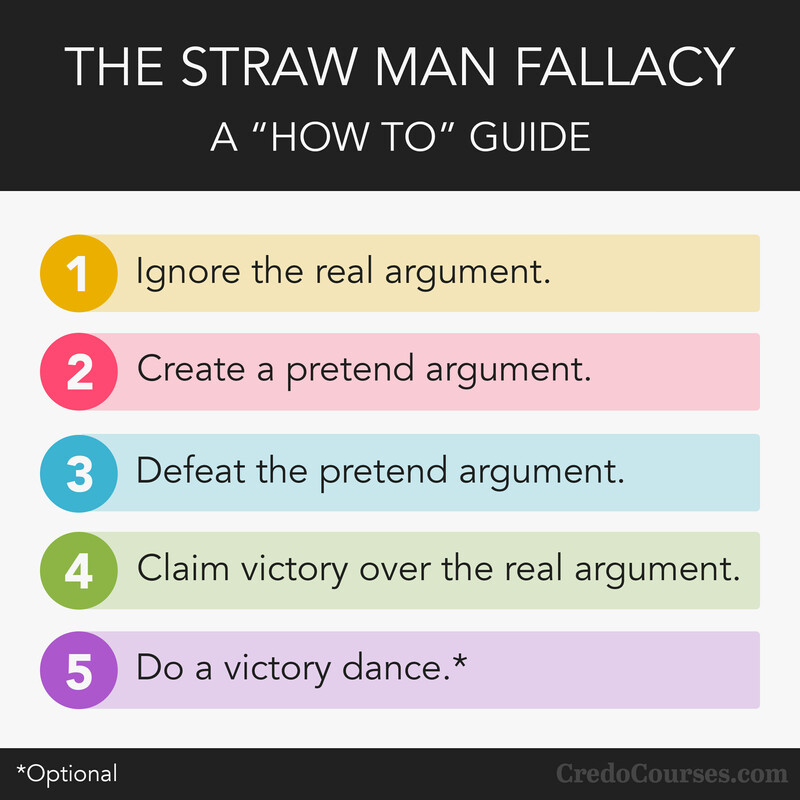 The straw man fallacy occurs when someone attacks an incorrect or inaccurate representation of a position. Usually this misrepresentation is weaker than the actual argument in some way. When the attacker defeats this straw man version of the position, they then claim victory as if they had defeated the original argument. The straw man fallacy is committed when an arguer distorts an opponent’s argument for the purpose of more easily attacking it, demolishes the distorted argument, and then concludes that the opponent’s real argument has been demolished. By so doing, the arguer is said to have set up a straw man and knocked it down, only to conclude that the real man (opposing argument) has been knocked down as well. Fallacies are all around us, but not all fallacies are created equal. 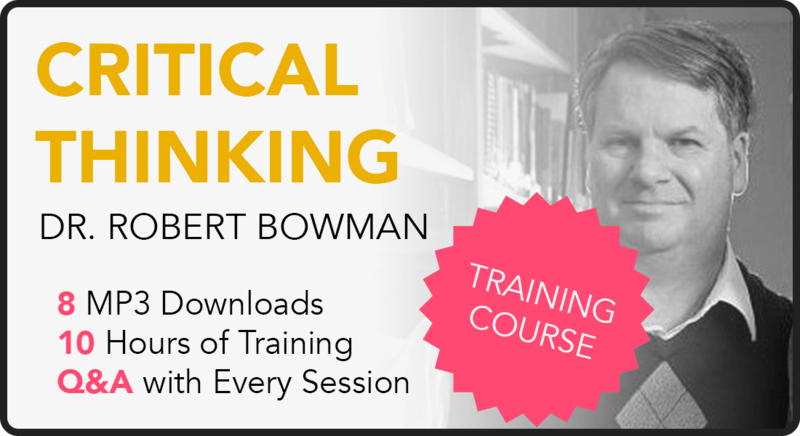 When critiquing a position, argument, or line of reasoning, there are two broad categories fallacies may fall into: formal and informal. Formal fallacies occur when there is a defect in the structure of an argument or the truth value of one or more of its propositions. An informal fallacy can be found be examining the content of an argument. Everyday communication is usually not done via logical syllogisms (where formal logical fallacies would be easier to spot). Informal fallacies are not as easy to detect because there are so many, and the way they present themselves are often subtle (i.e. assumed in an argument rather than explicitly stated). An error of reasoning or tactic of argument that can be used to persuade someone with whom you are reasoning that your argument is correct when really it is not. Those republicans! They’re always opposing stricter gun control legislation. They care more about hoarding their guns than they do about the lives of innocent children. We care about our children. Obviously those republicans are just spouting a bunch of nonsense. Those democrats! They’re always proposing stricter gun control legislation. They want to force all Americans to turn in all their guns to the government. This is clearly an example of government run amok. Those democrats couldn’t make a sound argument to save their lives. In both cases the actual claims (stricter gun control legislation or less strict gun control legislation) is ignored. Instead caricatures of the real arguments are argued against. Once these weakened arguments have been defeated, victory is proclaimed over the actual positions. James 1:17 All generous giving and every perfect gift is from above, coming down from the Father of lights, with whom there is no variation or the slightest hint of change. I Kings 8:56 “The Lord is worthy of praise because he has made Israel his people secure just as he promised! Not one of all the faithful promises he made through his servant Moses is left unfulfilled! all your just regulations endure. Numbers 23:19 God is not a man, that he should lie, nor a human being, that he should change his mind. Has he said, and will he not do it? Or has he spoken, and will he not make it happen? Hebrews 6:18 so that we who have found refuge in him may find strong encouragement to hold fast to the hope set before us through two unchangeable things, since it is impossible for God to lie. God is not simply one who tells the truth he is the transcendent ground of all reality. Truth is grounded in his very being and nature. The Bible also instructs Christians to be followers of God, exemplifying his character in all they do. Therefore, Christians should carefully consider their arguments, ensuring that they do not engage in the use of any straw men, not because it makes for a better argument (although it does), but because arguing in accordance with the will of God is one way Christians glorify their heavenly father.